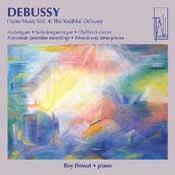 This is the fourth and final CD in the Complete Piano Music of Claude Debussy recorded by Roy Howat. The major works here are the Arabesques, Suite Bergamasque and the Children's Corner suite. Of great interest to those interested in French music is the world premiere recording of a recently-discovered work Intermede, unearthed in the US in 2001. Roy completes this project with his customary understated style honouring the composer's intentions, and for this CD he has recorded with one of the innovative Australian Stuart & Sons pianos. Vol 3 - TP164 (Preludes Book 2, Estampes and world premiere of "Les soirs illuminés par l'ardeur du charbon"
Tall Poppies is an Australian label, devoted principally to the work of musicians from that continent. Roy Howat is Scottish, married to the Australian composer, Wendy Hiscocks, and spends a significant amount of time in Australia teaching, lecturing and playing. Tall Poppies embarked on this project because they considered that Howat’s Debussy was so different to any they had heard before and fit into what [they] consider an Australian ethos of performance, which is sort of an antipodean view of the world which sometimes brings new insights into European classical music. He is an outstanding pianist, and it is exciting to have his four-volume Debussy series now complete. Howat is not only a fine pianist; he is also a considerable Debussy scholar, having contributed a book to the literature - Debussy in Proportion - plus numerous articles. He is also an editor of the Paris-based Complete Debussy Edition, so he is truly immersed in this music. The result is that his playing has a tangible sense of authority, easily sensed from the very first track of each CD. He has also contributed the exemplary and extensive booklet notes, and it is gratifying to see research and performance interacting in such a creative and intelligent way. One specific example; Howat has noted from Debussy’s own piano roll performance (and other sources) that part of the famous prelude La cathédrale engloutie is printed in note-values of twice the intended duration, and has adapted his performance accordingly. This interests me, in that I had always felt that this piece, wonderful though it is, dwarfed the other preludes, being more than twice the length of most of them, and, listening to Howat's reading, it makes perfect musical sense to do as he has done. A characteristic of Debussy’s that comes over surprisingly strongly in this set is his humour. It’s there not only in such obviously comical numbers such as Général Lavine – excentrique, or Hommage à S.Pickwick esq., P.P.M.P.C, but also, more subtly, in the allusions to other music, such as Handel, Bach and Daquin, all hinted at in quick succession in the finale of Pour le piano. Titles are often deliciously witty too; the lovely La plus que lent, almost impossible to translate, but meaning something like “The slowest of them all” was a wry comment on the fashion for very slow waltzes; while the romantic sounding Les soirs illuminés par l’ardeur du charbon – Evenings lit up by the glowing of coal - despite being a quotation from Baudelaire, simply reflects the fact that, in the bitterly cold, war-torn Paris winter of 1917, Debussy received a welcome delivery of coal from a local merchant, then wrote the work as a “thank-you”. That piece, receiving its first ever recording, is just one of the numerous rarities which are liberally sprinkled amongst the more famous works. Some are of little consequence, but some are well worth hearing. Vol. 2, for example, contains the extraordinary Berceuse héroïque of 1914, a powerful and gloomy work, written in the very early days of the Great War. It has a subtly understated march-like tread, and its progress is marked by disembodied fanfares. That is followed by the Page d‘album, donated to support the work of an organisation called Le vêtement du blessé (The dressing of the wounded), which Howat describes as “an exquisite little waltz”, and an interesting Elégie. This would make a good one for a “blind” listening session with friends. The name of George Gershwin is sure to come up much sooner than Debussy’s, as it’s full of lovely jazzy “squelches”, and the sort of textures Gershwin employed so effectively in his Preludes. Then comes the first book of Etudes, in which Debussy, like Chopin before him, uses technical issues as a “camouflage” for intensely poetic music. Here, as in the second book, Howat is an ideal interpreter, making no concessions to the often acute difficulties of the music, yet catching the character of each piece superbly. There isn’t the space to go through all of these; to take one example almost at random, listen to track 6, Pour les quartes (“For fourths”), in which little bursts of pentatonic orientalism alternate with darker, whole-tone sounds, building up an incredibly rich and allusive tonal picture. And all this so as to practise those nice smooth 4ths! The disc ends with the second series of Images. Here again, Howat is immensely disciplined, so that the precise imagery of the first movement, the wonderful Cloches à travers les feuilles (“Bells across the leaves") is etched out clearly, with no blurring of the rhythmic outlines. In his notes, Howat reminds us of Debussyís insistence, no doubt with errant pianists in mind, that his music must be played "exactly in time". Volume 2 features Book 2 of the Préludes, the early Images oubliées, and the three short "war effort" pieces described earlier. It concludes with an “unofficial” suite, the Suite Bergamasque whose inclusion in this form Howat justifies by explaining how the three pieces contained within it were undoubtedly intended as a triptych, even though they were never published as such. It’s a fascinating story, far too long to recount here, but quite convincing given the circumstances, and totally born out by the musical result. The final piece is L’isle joyeuse – “Island of joy”, a semi-autobiographical reference to Jersey, where Debussy had eloped with his mistress Emma Bardac . This is surely one of the composer’s high points, a thrilling tour de force. Howat flings himself at this piece in an uninhibited way that captures the spirit of a live performance, building through the final sequence of key-changes to a climax which is only equalled in the composer’s music – not surpassed – by the ending of La Mer. This is inspired, seat-gripping stuff. The Préludes receive equally splendid treatment, with Howat excelling in the rustling textures of Feuilles mortes (“Dead leaves”) and, at the other extreme, the jagged explosions of Feux díartifices (“Fireworks”). Volume 3 contains the Estampes, the first book of Préludes, the suite Pour le piano, and a number of shorter pieces. These are Les soirs illuminés par líardeur du charbon described above; the tiny Morceau de concert; the delightful ragtime Le petit Nigar; the witty trifle Hommage à Haydn, in which the eponymous composerís name is “spelt out” in the musical notation, and, concluding the disc, the wonderful La plus que lente. The Préludes are given performances as imaginative as those of Book 2 on the previous disc, with tempi that are often surprising on first hearing, but which always make perfect expressive sense. The first one, Danseuses de Delphes, is a perfect example – just a shade more flowing than usual so that the music does indeed dance, with the sustaining pedal used sparingly. I met and talked with Roy Howat at a Royal Academy of Music (London) seminar yesterday. The day before, entirely by chance, I received from Australia his Debussy recordings for review! Tonight, he has a Chabrier event at RAM. Sampling the (very) complete Debussy piano works (several discoveries in his researches, and the fullest of annotations in the liner notes) I quickly formed the view that this was Debussy as I wanted to hear it, and wished I could make (the easier) pieces sound like that. The secret is his philosophy, which excludes "aggressiveness" and the combination of sympathetic instruments, venues and audio engineering. I will concentrate on the most recent, but have enjoyed already the Études in Vol.1, less strenuous than some others. Vol 4 has early works, some of them very familiar to piano pupils young and old. Andras Schiff, beginning a notable series at Wigmore Hall, challenged audiences to his Chopin and his Idols recitals by deploring the commonly held assumption, that " pianos should always be black and made by Steinway". Howat recorded this completion of his integrale at Newcastle Conservatorium, on an Australian piano, Stuart & Sons No 1, presided over by Wayne Stuart himself. The outcome is pellucid playing of the greatest transparency and sensitivity to the voicing of the music (q.v. Music Web's full appreciation) which, however, doesn't go into the question of 'horses for courses' i.e. the right piano for particular composers. It is always frustratingly like walking into the middle of a movie to receive the third or fourth release of a continuing series in a complete cycle -- The Complete Piano Music, Volume 4, "The Youthful Debussy" -- without having heard (or in this case, even having heard of ) the preceding volumes. It is especially so in this case since, according to the programme note, Roy Howat is something of a noted Debussy scholar and specialist, having studied the composer's manuscripts and edited most of the pieces heard here. He has also discovered a number of previously unpublished Debussy scores. Adding further to the interest of this disc is an Australian-made Stuart & Sons concert grand, which again according to the note is especially well-suited to this music, having two soft pedals that allow Debussy's con sordina indication to be observed in a way that cannot be on most modern pianos. I must say that this is Debussy played in a way I haven't often heard it, and the more I listen to the disc the more convinced I become that this is what Debussy himself intended. A century's worth of accreted misconstrued notions about the æsthetics of French Impressionism in general and Debussy's sound world in particular have led to at least one school of performance that renders his music vaporous if not vapid. But is this what Debussy had in mind? We learn from the fascinating insert note that while studying in Paris with Vlado Perlemuter, Roy Howat often played for Debussy's stepdaughter Dolly de Tinan, prompting from her detailed accounts of how her stepfather played. Contrary to the blurred harmonies and washes of colour we often hear today, Debussy apparently insisted on "polyphonic and architectural clarity and rhythmic alertness to the dance." Returning to the Urtext, these are qualities Howat brings in abundance to his playing. Most of the pieces included in this fourth volume should be familiar, with the exception of Intermède, which is claimed to be a first recording. Everything here is categorized as early Debussy, the Danse bohémienne from his eighteenth year (1880) being among the composer's earliest surviving works. The remaining pieces in this instalment are of an exact date uncertain due to discrepancies among original manuscripts and early publications in different editions. The latest completed work here (1908) appears to be Children's Corner -- of which Debussy himself made a Welte piano roll approximately around the time -- so we can assume that all the other material is earlier. Perhaps it should not be surprising that some pianists closer to Debussy's own time exhibit the deepest understanding of the nature of his music. One of them, Walter Gieseking, became one of the composer's foremost interpreters, and his 1950s recordings of the complete works (though less complete than Howat's) are still available on EMI. Closer to our own time, Michelangeli and Pollini (both on DG) have made significant contributions to the Debussy discography, as has Paul Crossley, whose four-CD set on Sony, which I own and very much enjoy, I no longer find listed. I must say, however, that the current Howat disc under review is truly some of the most revelatory Debussy playing I have heard. He takes very seriously the aforementioned notion of "polyphonic and architectural clarity and rhythmic alertness to the dance." These are interpretations that are crystalline in their purity, allowing every nuance of Debussy's subtle harmonic shifts and ambiguities to emerge and to blend with a structural logic. The recording from Australia-based Tall Poppies contributes enormously to Howat's agenda, providing a wonderfully detailed transparency that ought to be a paradigm for how to capture the sound of a piano on CD. But as long as I'm spreading the kudos around, let me also mention once again that the Stuart & Sons piano heard here is an instrument of special properties that is especially well suited to this music, and that Roy Howat is an exceptionally gifted musician who has devoted many years of study and scholarly research to Debussy's life and works. Based solely on this one disc, I would urge you to acquire not only this fourth volume in the series, but the three that precede it as well. Unlike Tchaikovsky, Debussy was frequently face to face with Nadezhda von Meck. He was her house pianist for three summers from 1880, and they played duets, including Tchaikovsky No 4, as she reported: 'Yesterday for the first time I played our Symphony with my little Frenchman. I cannot play it without a fever penetrating all the fibres of my being and for a whole day I cannot recover from the impression.' At eighteen Debussy made up for any technical deficiency by his score-reading. Madame von Meck was sufficiently impressed with the abilities of her 'Bussik' that she sent Tchaikovsky the Danse bohémienne. Tchaikovsky considered it 'a very nice little thing, but altogether too short. Not a single thought is developed to the end.' Its originality certainly deserved less faint praise than that [listen -- track 1, 0:00-1:06]. At maison Meck Debussy was also pianist in a resident trio. This was the occasion for his writing a piano trio of his own. It was published only in 1986. Tchaikovsky heard about it, and Mme von Meck bemoaned the fact that he had not yet produced a trio. (She had to wait a couple of years for Tchaikovsky's mammoth Op 50.) The Intermède of the CD turned up only in 2001, making this a first recording of a fascinating piece. Playful and capricious, it is essentially a version of the Scherzo-Intermezzo from the trio. In his admirable notes, Roy Howat argues convincingly for Debussy's authorship, though the manuscript is in the hand of Dumesnil [listen -- track 2, 0:00-1:14]. That same year of 1880 Mme von Meck introduced Debussy to Wagner in Venice. It took a decade for Debussy to work through his Wagner enthusiasm, and realise he must escape the influence that was making Paris, that 'kept woman of a city', a prime centre of Wagnerism, literary, philosophical and musical. Mazurka is as unWagnerian as much of Wagner's own piano music. Germans have always been uncomprehending on the subject of Slavs, and a safe way to elude Wagner was to attempt a Polish dance. Harmonically this still inhabits the world presided over by Mme von Meck [listen -- track 4, 0:00-1:05]. The Ballade is already in idiom more Debussy's own. Still he was in revolt against Germany, as he made clear in its original title, 'Ballade slave'. Even in 1880 he had expressed his distaste for German music. He told Mme von Meck it was alien to the French temperament, heavy and lacking in clarity. In return she thought him 'a typical Parisian boulevard product'. Chopin was as much a Slav as Meck, but he had migrated with total success to the centre of French culture. In his Ballade, Debussy shows clearly enough for the first time on this CD that he is indeed the Frenchman [listen -- track 6, 0:24-1:28]. I have concentrated on Debussy's earliest keyboard music, not only in gratitude for Roy Howat's skilful presentation of it to us, but also because Debussy is at his most fresh and beguiling. The later music may be more characteristic of the mature composer, but here is both innocence and the charm of discovery. Roy Howat has made this music very much his own, and has rightly earned golden opinions with his performances. If now and again I am reminded of Alfred Cortot and his reiterated comment to any pianist coming before him at a Siena masterclass I attended, it is a remark that invariably occurs to me at some moment in every such recital: 'più piano, please'.